It took Elvis Presley to wash away tears we’d shed over the loss of James Dean. Love Me Tender began the healing with saturation bookings in November 1956. 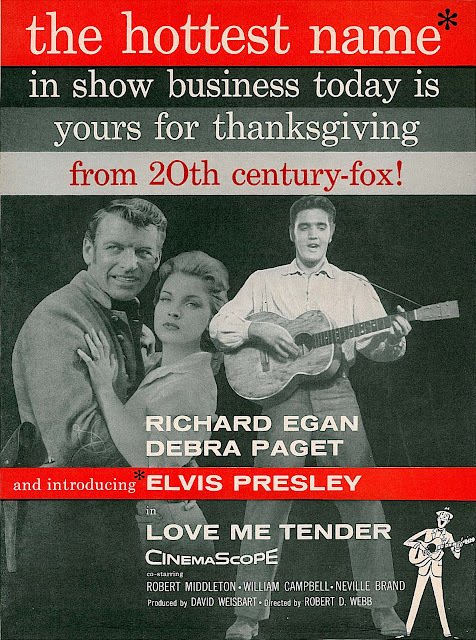 Unlike Warners’ slow rollout of Giant, Elvis and company surged in with a (for Fox) record of five hundred prints to make sure everyone wanting Presley got him then and there. Love Me Tender came into many theatres right behind Giant, and lines announced youth’s embrace of a new teen idol. Should 1956 Hollywood go forward with that proposed Dean biopic, why not let Elvis play Jimmy? It was considered, perhaps not seriously, but few concepts flew higher than a newly minted sensation enacting another who had lately departed. Presley was a known Dean acolyte, but too fresh and untried to haul burdens of a posthumous image darkening with sad and sadder stories of how life and people had let Jimmy down. "Kansas City filmmaker" Robert Altman (so identified by the trades) went in search of loner Dean with scriptwriting George George in a spec documentary project they’d begun in November 1956. 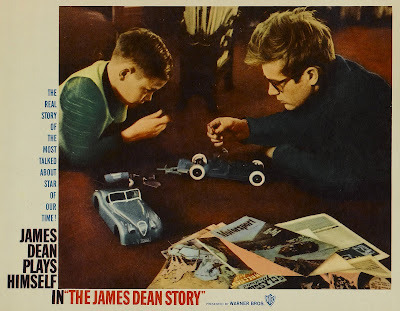 The James Dean Story was (so far) sixty-five minutes of profile and interviews with Jim’s relatives back in Indiana. Months passed with bankrolls depleted (by $20,000) as Altman and George shopped their project around for distribution. Would the Dean cult last as long as these two would take to set up a deal? TV networks were better able to strike while Dean irons simmered. He’s hotter than anybody alive!, said one NBC exec. That web was repeating a Robert Montgomery Presents that Dean had done with Ed Begley and Dorothy Gish called Harvest, while CBS was giving third broadcast go round to The Unlighted Road, a Playhouse Of The Stars featuring Dean. CBS also reran I’m A Fool, with Natalie Wood among Jim’s support. All these were scheduled during a Dean-heavy month of November when old anthology product with the actor regularly Trendex-trounced competing stations. All three shows exploited the Dean legend for frankly commercial purposes, said TIME, but as any JD footage was so many ribbons of gold, how could you blame networks for mining them? Warners meanwhile noted awards and nominations still coming Dean’s way. Golden Globe "Henriettas" went to he and Kim Novak in March 1957, while the Academy tabbed Jimmy among possible Best Actors for his work in Giant. It was time for WB to get serious about their backlog. No more limited engagements and catch-as-catch-can bookings for East Of Eden and Rebel Without A Cause. In response to the overwhelming demand, said advertising, both would be reissued with a new campaign for nationwide combo runs in 1957. Let kids pose with Dean standee. Tie in with local photog or use personal camera, said new pressbooks, Offer free pictures between five and seven PM. Still taboo was mention of the actor’s death in publicity kits. A psychologist or member of the clergy could give talks at the theatre on the meaning of James Dean to teenagers was closest they’d come to dealing with the cult and its cultural ramifications (but what right-minded showman would furnish a lectern for such?). 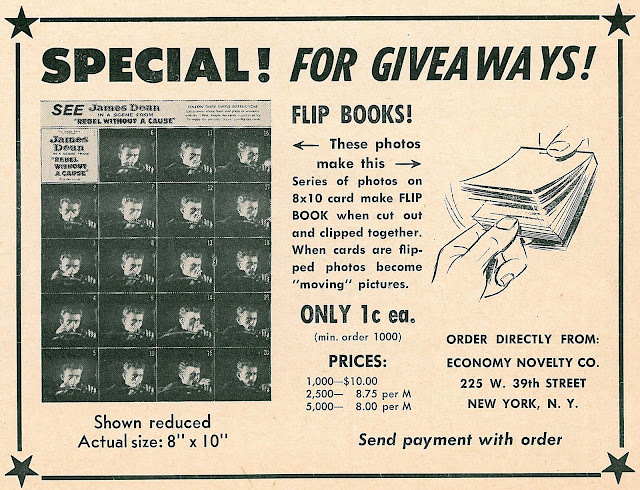 Flip-books of the chicken run sequence from Rebel Without A Cause were made available to whet darker patron appetites, while taglines trumpeted the Academy nomination for Giant. Eden/Rebel played percentage and fattened many an exhibitor’s purse, in addition to enabling recent Dean converts to catch up with his limited output (not unlike later James Bond fans turned on by Goldfinger acquainting themselves with earlier 007 via the Summer 1965 encore of Dr. No with From Russia With Love). As time passed, Dean cultism was eased toward the margins. Kids were ready to ease up and have a little fun with it. Enter the spook showman. If fans were so anxious to bring Jimmy back, well, that was simple enough. 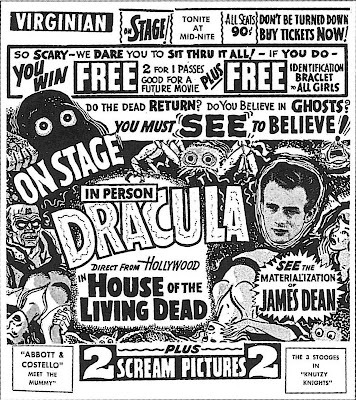 New York’s Jefferson Theatre offered "The Materialization Of James Dean" as part of a stage show wherein JD shared residency with Count Dracula in a so-called "House Of The Living Dead". So much for respectful tribute. The press reported a teen girl found slumped and writhing in her seat in the wake of shock and convulsions sustained during the show’s climax. Two male rowdies had been fighting in an adjacent aisle. One of them kicked her in the head while the lights were out. All this followed said materialization, which consisted wholly of the showing of an illuminated photograph of Dean’s face during one of innumerable blackouts. Hooliganism was an increasing problem as youth patrons emulated anti-social behavior they observed on screens playing The Blackboard Jungle, American-International delinquency pics, and yes, Rebel Without A Cause. Increasingly raucous spook rallies did little to restore calm. A dozen uniformed NYC police were needed on this occasion to quell effects of electric shocks, face-slapping from invisible hands, and a roving gorilla named Gargantua. Ushers with luminous painted features chased up, down, and between rows as screen attraction Abbott and Costello Meet The Mummy unspooled. Others were poised meanwhile to exploit gothic possibilities of ongoing Dean fascination. Faded from airwaves Maila Nurmi (aka Vampira) saw profit potential in one-time association she’d had with JD. They’d been friends, maybe more, she implied. Anyhow, the Dean factor fleshed out an act gone stale on fading memories of Vampira’s single year hit doing Los Angeles television, and she’d make the most of it. Maila claimed to be in communication with Dean through the veil and not adverse to on-stage discussions regarding the black magic curse she’d placed on the departed actor for having spurned her. Jimmy’s fans called out to me: "Did you kill him?" I didn’t answer them. 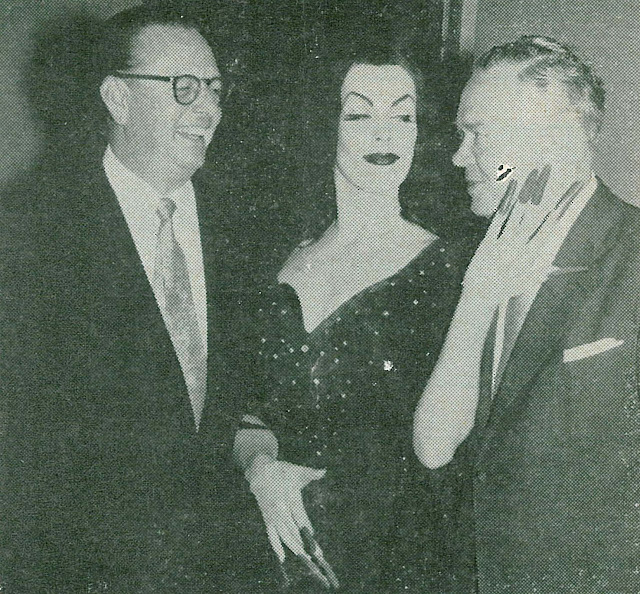 The Vampira act was useful adjunct to shilling she’d done up and down the California coast during April 1957 for United Artists’s double chiller bill of Voodoo Island and Pharoah’s Curse (here she’s posed with Bel-Air producer Ed Zabel and a Fox West Coast Theatres manager). The restless spirit of James Dean was now inexorably linked with carny-inspired freak fairs and low-budget horror-thons. All this as someone else picked up the Academy Award for which Dean had been nominated. Sensing perhaps a need to dignify, if not honor, Dean’s memory, Warners lent support to an (at last) worthy gesture in his name. 1956 had been recorded as California’s blackest year from the standpoint of traffic deaths. An exhibitor who was also Public Information Director for the California Traffic Safety Foundation submitted a script to WB for a short highlighting the problem. 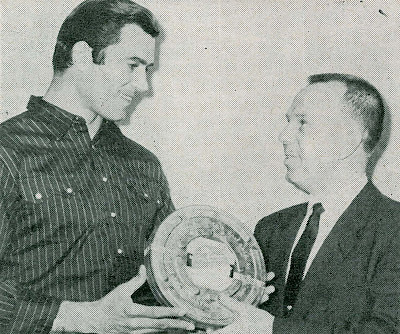 Would they consider making a public service film with Cheyenne’s Clint Walker as on-screen host? Television division exec William Orr volunteered studio resources for a subject which would ultimately go to National Screen for distribution. 150 California first-runs got it free for a week beginning June 26, 1957, with drive-ins and other venues to follow after the July 4 holiday (host Walker is shown here taking delivery of a print). Within the week, another Presley feature opened. Loving You would further chip away at Dean’s youth idol preeminence. An Elvis craze was sweeping the country, and it was bigger than Jim’s ever was. Jailhouse Rock would be along in October with the promise of many more to come. Warners had meanwhile dragged feet committing to distribution for Altman and George’s documentary. 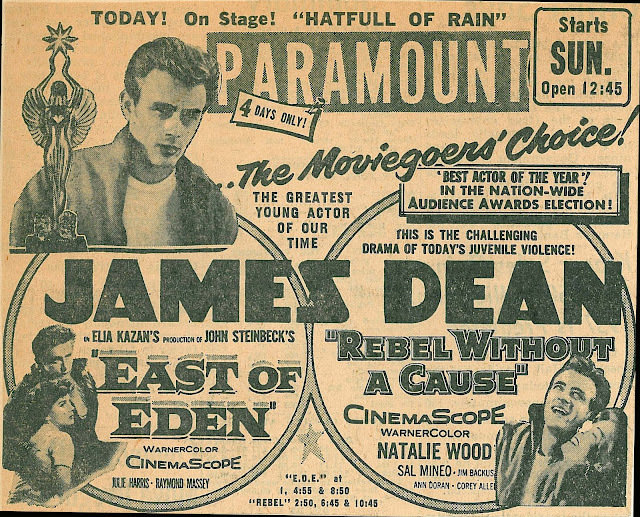 The James Dean Story was finally announced for WB release in June 1957, but they’d first need to polish it up with industry sheen missing from the barely over an hour’s content submitted by the Kansas City filmmakers. A musical score was added and rocker of the moment Tommy Sands sang a theme tune (Let Me Be Loved) penned by veterans Jay Livingston and Ray Evans. A heavy score by Leith Stevens and doom-laden narration by actor Martin Gabel emphasized downer aspects of Dean’s life, as though early death were just another sad chapter laid atop those many preceding it. Warners fleshed out the running time to 83 minutes with screen tests Dean had made for East Of Eden and at last permitted public scrutiny of that road safety spot with Gig Young intended for Warner Brothers Presents. 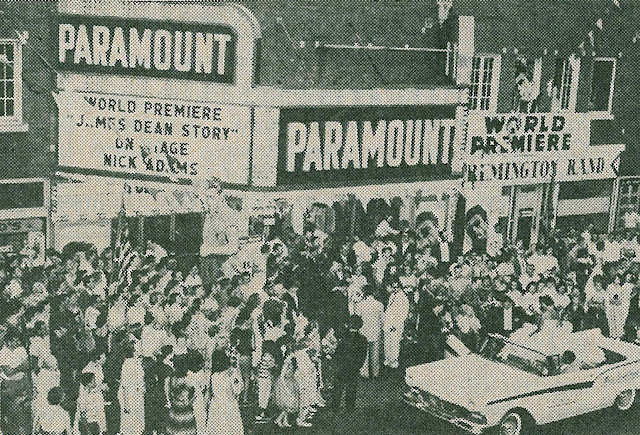 There would be an August 13, 1957 (near) hometown premiere for The James Dean Story at the Paramount Theatre (shown here) in Marion, Indiana. The state governor and Indiana’s US senator were in attendance. Eveready Nick Adams flew in from Hollywood and opening festivities were coordinated with the annual County Fair in full swing. A huge night parade featured school bands, saddle clubs, girl and boy scouts, plus the Strategic Air Command in flight. Nick Adams, then reigning Miss Fairmount, plus other dignitaries, visited Dean’s old high school and his grave, with a barbecue for all capping festivities at the Winslow Farm where Jimmy had lived with his aunt and uncle. A twelve foot monument unveiled for the premiere may or may not still be standing (anyone know? ), though WB presumably stood good on its pledge to donate opening proceeds to a Fairmount school for aspiring actors. 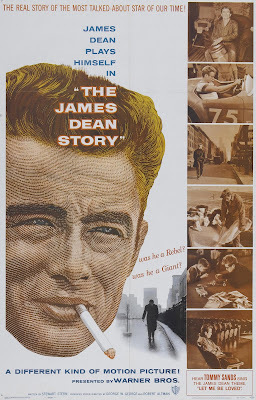 Seventy-three Indiana theatres played The James Dean Story after its regional premiere. Then business fell off. Hindsight suggests Warners waited too long to get the documentary out. 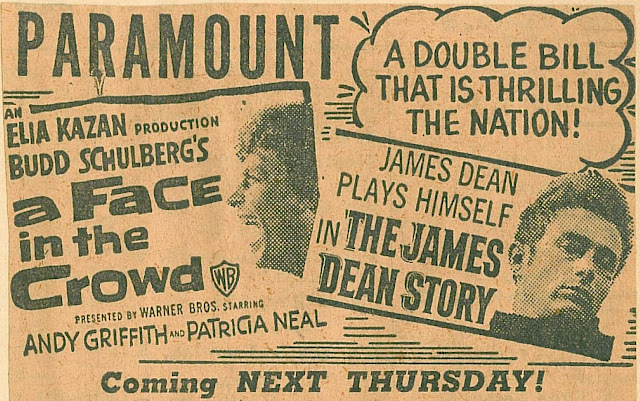 New York’s double feature playdate at their Paramount Theatre found The James Dean Story supporting The Black Scorpion, while other situations put it in second position behind A Face In The Crowd (as shown here). TIME’s review was expectedly dismissive. It exploits a ghoulish clamor for Dean’s voice to echo once more from the grave, but it does so with a mortician’s lugubrious solicitude for the living. Soft domestic rentals of $335,000 for The James Dean Story suggested a cult having run its course. Warner’s modest pickup cost of $50,000 assured they’d get a profit, and that in the end amounted to $200,000. This would be the third and last James Dean released since his death. There was nothing left to sell. By mid-1958, WB had Jimmy’s dramatic successor launched in a western slated originally for Dean. The Left-Handed Gun is one of those where you can shut your eyes or ears and summon up JD even as Paul Newman emotes the title role. Newman seems to me to have had much the (early) career Dean would have enjoyed if not for 9/30/55. The two were screen-tested together in 1954 for East Of Eden, the footage still extant. Would Warners have given Newman such late 50’s opportunities with Dean still living? The sad dispersal of East Of Eden and Rebel Without A Cause to televised oblivion happened in Summer, 1960. Both were dumped into late shows and ninety-minute berths nationwide. For these two pictures carefully composed for Cinemascope projection, the loss was especially ruinous. It would be years before either would be seen properly by audiences discovering Dean. 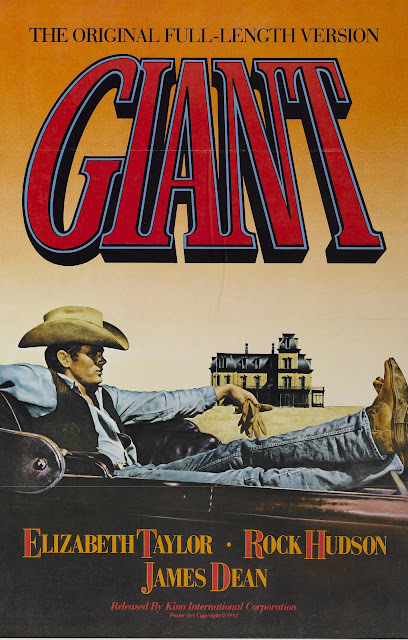 Giant was held back for theatrical reissues. The first of these in 1963 played Dean’s participation way down. The trailer spotted him fleetingly and near unrecognizable in a scene where he's covered with oil. That seven years later campaign was all about Liz and Rock (their names towering high in previews). Why promote Dean and give emphasis to the fact you’re peddling an old movie? The cult of yore was surely a spent thing by 1963. It would echo if faintly when Warners’ 1970 reissue trailer appeared. By then, a culture of disaffected youth had thrown its net over most filmland product, as witness narration: The star who became a legend, who spoke for all the restless young as no one has before or since (domestic rental take for Giant that year was $539,000). Marketing of Giant since has been given over altogether to Dean’s image. Kino’s 1982 reissue featured him alone on its one-sheet (shown here), while Warners DVD distribution finds Giant absorbed into a box set tribute to the actor. I really enjoyed reading these these, thanks very much. MMM nice photo of Buster, never seen that one before. It's from "The Cameraman", no? And, Marceline Day is the girl, isn't that right? God only knows how Eddie Mannix must have looked after that fracas! Do you think ANYONE in the theatre that night was actually paying any attention to "Abbott & Costello Meet the Mummy"? I wonder. R.J. It's "The Cameraman". By the way, these top banners will be changing often, as I'm having a lot of fun doing them. Speaking of Jailhouse Rock and 1950's traffic fatalities. Lest we forget Elvis's "Jailhouse" co-star, the lovely Judy Tyler. Judy was killed instantly in a nasty auto accident just after Jailhouse Rock wrapped and four months before it hit theaters. One wonders how bright her career would have been.